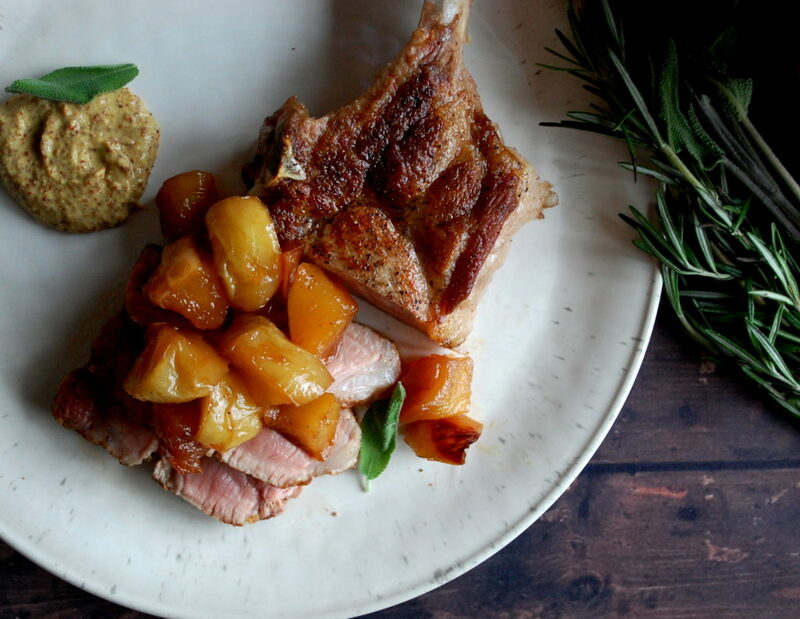 A simple, seared pork chop is hard to beat, and also easy to mess up. 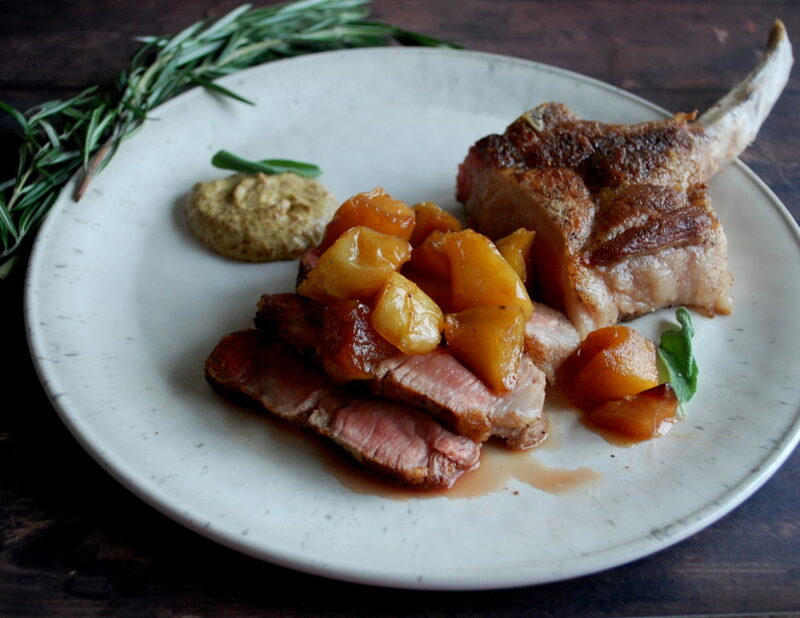 Accomplish that perfect sear and all you need to complete the dish is a rich sauce or, in this case, a spiced apple chutney. A lot of people I’ve cooked for have asked me why their chicken breast doesn’t look as golden or why their steak lacks that beautifully caramelized crust. Well the same steps must be followed for really any piece of meat in order to achieve the perfect sear. 1. Let the meat sit out at room temperature for a good 30 minutes. This allows the meat to relax and essentially prepare for the shock of the heat. 2. Use paper towels to pat the meat dry. You want the meat to be completely free of moisture before hitting the pan. 3. Use an oil with a high smoke point such as vegetable oil. And don’t use too much oil in the pan, just enough to coat the bottom. 4. Heat the oil over medium heat so that it doesn’t heat too quickly. If you heat it over high heat, the meat will tend to burn before searing once it hits the pan. Keep the heat at medium and be patient while the oil heats up. 5. …..and make sure that oil is sizzling hot! I like to test a breadcrumb in the oil to make sure it sizzles before adding the meat. 6. Don’t overcrowd the pan. If you have the meat too close, it will steam and you will end up with soggy sides instead of a golden crust. Work in batches if needed to give the meat a good amount of space. 7. Once the meat touches the pan, leave it alone. If you try flipping it before it’s ready, the meat will stick. Give it a good few minutes before checking. 8. Once both sides have finished searing, transfer the meat to the oven so that it can slowly finish cooking. Once you get a nice seared crust on the pork chops, you want to keep a close eye on them in the oven. Pork is very dry when it overcooks. I usually pull them at about 130-135°F. This will ensure that after they rest, they will still be slightly pink and very tender. 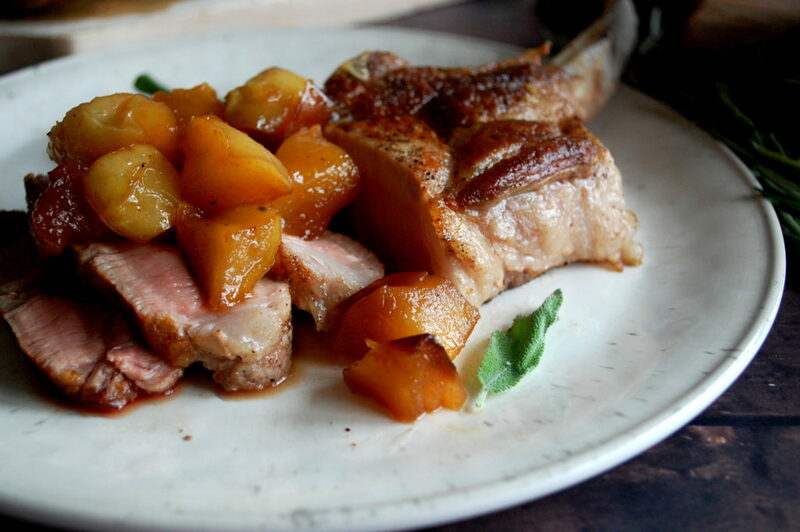 Pork also loves sweetness so I like to serve my pork chops with some type of fruit. This apple chutney is really simple to make, with most of the flavor coming from a combination of warm spices. To make a spice “sachet”, take a square of cheesecloth, place your whole spices in the middle, and use kitchen twine to tie it up like a purse. You can plop the sachet right into the chutney as it cooks so that the spices will infuse all of their flavors, while still being able to be easily removed. Enjoy! Make a sachet of the cinnamon stick, juniper berries, and cloves using cheesecloth and twine. Set aside. Heat the butter over medium heat in a large saucepan. Once melted, add the apples. Season with salt and pepper. Saute until caramelized and slightly tender, about 6 minutes. Add the apple cider and sachet. Bring to a boil. Add the sugars and stir until dissolved. Reduce the heat to a simmer and cook until the liquid has reduced to a syrupy consistency. Keep warm until serving. Preheat the oven to 400°F. While the apples cook, season each side of the pork chops with a generous amount of salt and pepper. Let them sit at room temperature so that they can temper. In a cast-iron skillet (or sauté pan), heat enough oil over medium heat to coat the bottom. When the oil is sizzling hot, place the pork chops in the skillet. Sear them for about 3-4 minutes per side. 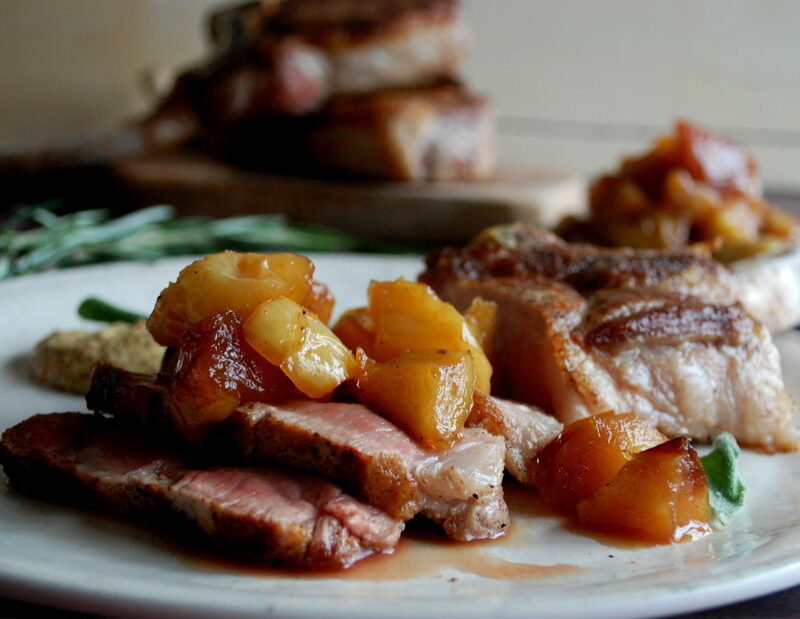 Transfer the pork chops to the oven and bake until they reach your desired doneness. 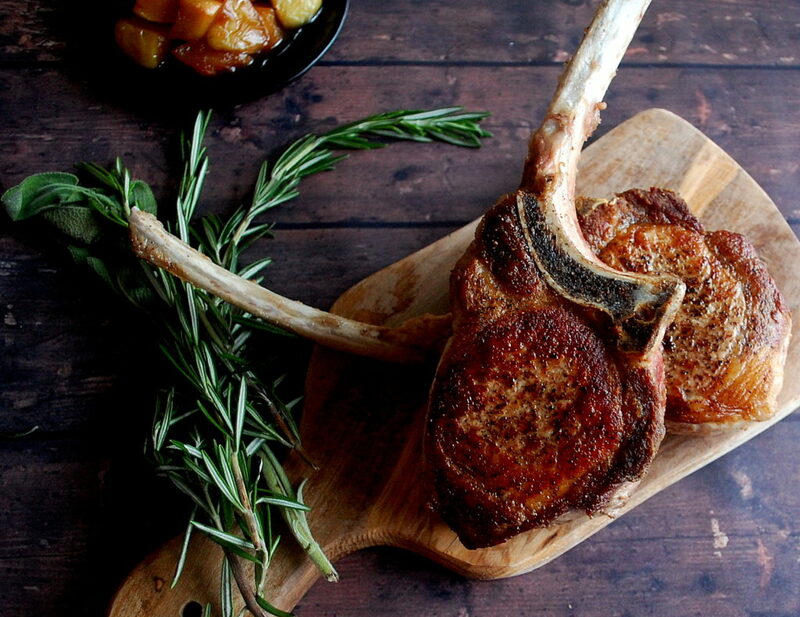 Let the chops rest about 10 minutes before serving. 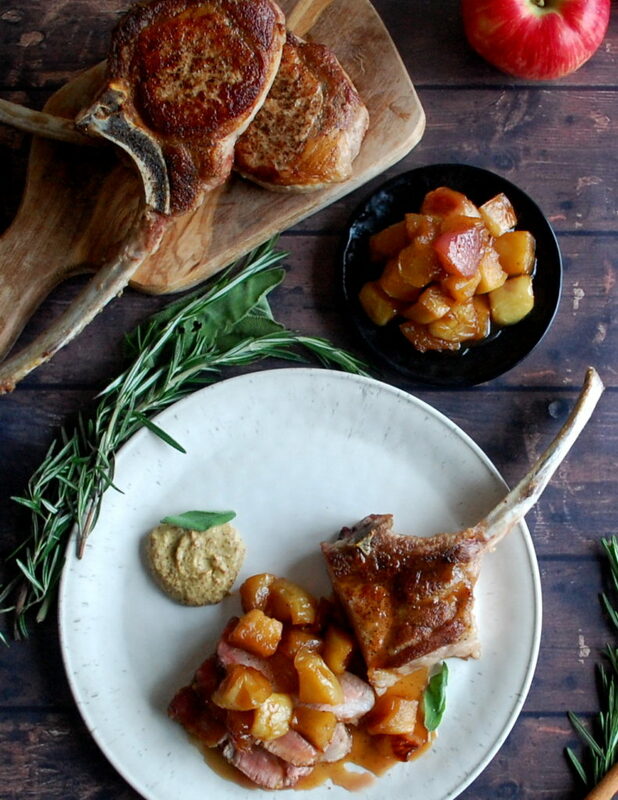 Serve each pork chop with a spoonful of apple chutney on top.